Apple today announced financial results for the second fiscal quarter of 2018, which corresponds to the first calendar quarter of the year. For the quarter, Apple posted revenue of $61.1 billion and net quarterly profit of $13.8 billion, or $2.73 per diluted share, compared to revenue of $52.9 billion and net quarterly profit of $11.0 billion, or $2.10 per diluted share, in the year-ago quarter. The revenue, profit, and earnings per share numbers were records for any second fiscal quarter in the company's history. Gross margin for the quarter was 38.3 percent, compared to 38.9 percent in the year-ago quarter, with international sales accounting for 65 percent of revenue. Apple also declared an increased quarterly dividend payment of $0.73 per share, up from $0.63. The dividend is payable on May 17 to shareholders of record as of May 14. In addition to the increase in the dividend payment, Apple says it will start a new share repurchase authorization of $100 billion and the company says it expects to wrap up its previous $210 billion repurchase authorization by the end of the current quarter. For the quarter, Apple sold 52.2 million iPhones, compared to 50.8 million in the year-ago quarter. iPad sales were up slightly to 9.1 million, up from 8.9 million a year ago, while Mac sales slipped to 4.1 million from 4.2 million. 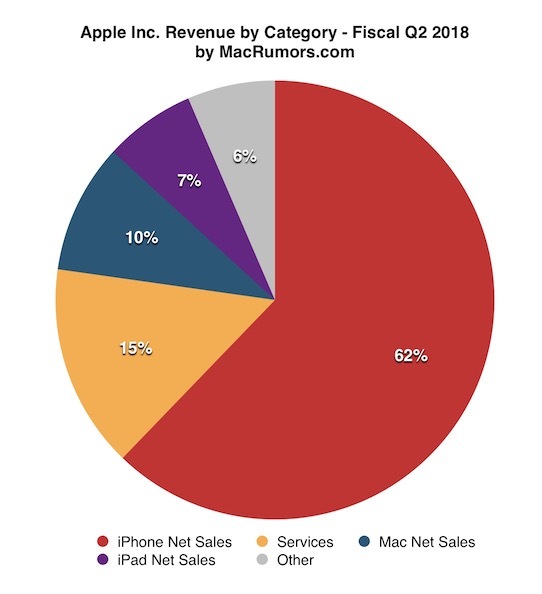 Apple's guidance for the third quarter of fiscal 2018 includes expected revenue of $51.5-53.5 billion and gross margin between 38 and 38.5 percent. Apple will provide live streaming of its fiscal Q2 2018 financial results conference call at 2:00 PM Pacific, and MacRumors will update this story with coverage of the conference call highlights. 1:39 pm: Apple's stock is up approximately 4 percent in after-hours trading following the earnings release. 1:43 pm: The average selling price of an iPhone was $728 in the quarter, down from $796 last quarter and $655 in the year-ago quarter. Still, Apple CEO Tim Cook said "customers chose iPhone X more than any other iPhone each week in the March quarter, just as they did following its launch in the December quarter." 1:48 pm: Apple's services category brought in $9.19 billion in revenue in the second quarter. That's an impressive 31 percent increase over $7.04 billion in the year-ago quarter. 1:55 pm: Apple's broad "Other Products" category brought in $3.95 billion in revenue in the second quarter. Like services, that's similarly impressive growth of 38 percent over $2.87 billion in the year-ago quarter. 1:55 pm: Apple's post-earnings conference call with CEO Tim Cook and CFO Luca Maestri begins in approximately five minutes. 1:58 pm: Apple posted year-over-year revenue growth in all five major geographical segments that it reports, including the Americas (+17%), Europe (+9%), Greater China (+21%), Japan (+22%), and the rest of the Asia-Pacific region (+4%). 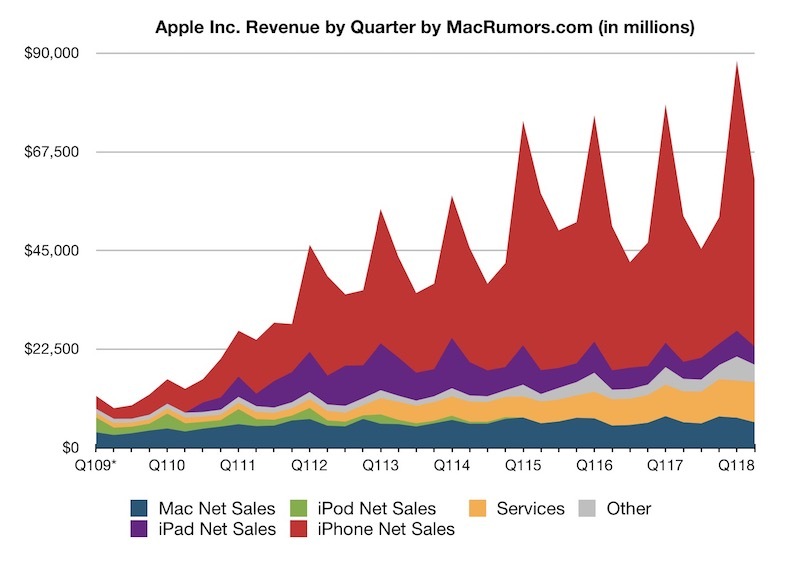 1:59 pm: Mac revenue remained flat at $5.8 billion. 2:00 pm: All in all, the results are in line with or better than Apple's own guidance and Wall Street expectations. Apple just recorded its best March quarter ever. 2:04 pm: Tim Cook: We're proud to announce the results of a very successful quarter today, setting new March quarter records for both revenue and earnings. $61.1 billion revenue. Sixth consecutive quarter of accelerating revenue growth. Broad-based growth. iPhone revenue up 14 percent, services revenue up 31 percent. Grew in each of our geographical segments. 2:06 pm: Tim Cook: All-time record revenue from services including the App Store, iCloud, Apple Pay, Apple Music, and more. Paid subscriptions surpassed 270 million, up over 100 million from a year ago, and up over 30 million from last quarter. 2:07 pm: Tim Cook: Apple Pay is coming to Norway, Poland, and Ukraine in the next several months. 2:08 pm: Tim Cook: Our wearables business is now the size of a "Fortune 300" company. Wearables revenue was up almost 50 percent, including AirPods, Beats, and Apple Watch. 2:09 pm: Tim Cook: We're looking forward to introducing HomePod to more markets around the world and adding new features soon. Breakthrough speaker. Widely regarded as the best-sounding speaker in its class. 2:12 pm: Tim Cook: AirPods are a "runaway hit." 2:14 pm: Tim Cook: We're now halfway through our fiscal year 2018 with nearly $150 billion revenue... we're very bullish on Apple's future. We have the best pipeline of products and services that we've ever had. Highest customer satisfaction and loyalty in the industry. Balance sheet and cash flow generation are strong, allowing us to invest significantly in our product roadmap, and still return a significant amount of capital to our shareholders. Recent tax reform enables us to deploy our global cash more efficiently. In the U.S., we expect our direct investment in the economy to exceed $350 billion over the next five years, with 20,000 new jobs over that timeframe. We look forward to sharing more information about our new campus later this year. 2:16 pm: Tim Cook gives update on Apple's capital return program: Today, given our strong confidence in Apple's future, we're announcing a significant update. Board of Directors has approved additional $100 billion share repurchase authorization. 2:16 pm: Apple CFO Luca Maestri has taken over the call. 2:17 pm: Luca Maestri is reviewing Apple's high-level financial results listed above. 2:17 pm: Luca Maestri: iPhone channel inventory reduced by 1.8 million units this quarter. 600,000 more units reduced compared to year-ago quarter. 2:18 pm: Luca Maestri: Across all iPhone models, 95 customer satisfaction rate, according to research firm 451 Research. 99 percent among iPhone 8, iPhone 8 Plus, and iPhone X. 2:19 pm: Luca Maestri: App Store set new all-time revenue record in March quarter. Apple Music paid subscriptions have passed 40 million. 2:19 pm: Luca Maestri: Over 90 percent of "Other Products" category growth came from wearables, including AirPods, Beats, and Apple Watch. 2:20 pm: Luca Maestri: iPad grew both in units and revenue for fourth consecutive quarter. 9.1 million iPads sold in March quarter. We gained share of the global tablet market, based on latest estimates from IDC, and active installed base of iPads reached an all-time high. 2:21 pm: Luca Maestri: 451 Research measured iPad customer satisfaction rates of 95 percent. Among business customers who plan to purchase tablets in the June quarter, 73 percent plan to purchase iPads. 2:21 pm: Luca Maestri is reviewing Apple's recent enterprise partnerships. 2:23 pm: Luca Maestri: Great performance from our retail and online stores, which produced their highest March quarter revenue ever. Our stores hosted more than 250,000 of our very popular "Today at Apple" sessions, with a particular focus on coding and app design. During the quarter, we opened beautiful new stores in Austria and South Korea, our first in each country. 502 Apple Stores across the world today. 2:24 pm: Luca Maestri: Apple has a net cash position of $145 billion. Returned nearly $27 billion to investors in the quarter. 2:24 pm: Luca Maestri: The biggest priorities for our cash have not changed over the years. Maintain cash we need for our day-to-day operations, to invest in our future, and flexibility to invest in the strategic opportunities that come our way. 2:26 pm: Luca Maestri: We're raising our dividend to 73 cents per share, an increase of 16 percent, effective with our next dividend, payable on May 17, 2018 to shareholders of record as of May 14, 2018. 2:26 pm: Luca Maestri: We're among the largest dividend payers in the world. We continue to plan for annual dividend increases going forward. 2:27 pm: Luca Maestri: We expect revenue of $51.5B-$53.5B in June quarter. Tax rate to be about 14.5 percent. 2:27 pm: The conference call is now being opened to questions from analysts. 2:28 pm: Shannon Cross of Cross Research asks about the sustainability of current iPhone pricing strategy, including iPhone X starting at $999. 2:30 pm: Tim Cook: iPhone revenue was up 14 percent in the March quarter ... We're going to continue to provide different iPhones to meet their needs ... customers chose iPhone X more than any other iPhone each week in the March quarter, just as they did following its launch in the December quarter … Since we split the line with launch of iPhone 6 and iPhone 6 Plus in 2014, first cycle we've had where top-of-the-line iPhone model has also been the most popular. With the customer satisfaction of 99 percent, the iPhone X is a beloved product. I think it's one of those things like a team wins the Super Bowl, maybe you want them to win by a few more points, but it's a Super Bowl winner. That's how we feel about it. I could not be prouder of the product. 2:31 pm: Katy Huberty, Morgan Stanley: Services revenue growth is the biggest driver in the quarter in my opinion. What contributed to this? 2:34 pm: Tim Cook: The great news about this is it's not a single geographical segment or a single service. We set records from the App Store to Apple Music to iCloud to Apple Pay and more. Underneath that, if you look at the subscription numbers, paid subscriptions have increased over 100 million on a year-over-year basis to over 270 million at the end of the quarter. In terms of longer term, we're on target to our goal of doubling our services revenue of 2016. 2:35 pm: Tim Cook on US-China trade war/tariffs: "I'm a big believer that both countries can win and grow together." 2:36 pm: Question: "What's working for China in right now? iPhone X specifically or something else?" 2:38 pm: Tim Cook: iPhone X was the most popular smartphone in all of China last quarter. iPhone X has done well there. In order to hit our growth of 21 percent in revenue there, it's other things, including our wearables business, our services business. iPhone obviously had to do extremely well. We gained share in the market for the Mac as well. There's actually several vectors there that are working well for us. 2:39 pm: Amit Daryanani, RBC Capital Markets: How does Apple protect consumer data? How does this translate into a positive for Apple over time? 2:40 pm: Tim Cook: We protect it by encrypting it. We keep the bulk or significant amount of information on the device so the user is in control of it. We also collect much less data than others do. If you look at our model, if we can convince you to buy an iPhone or iPad, we make a little money. You are not our product. Privacy is a fundamental human right. Extremely complex situation if you're a user, to understand a lot of the user agreements and so forth. We've always viewed that part of our role is to make things as simple as possible and provide them a level of privacy and security. 2:41 pm: Steven Milunovich, UBS: Could you talk a little more about capital allocation? Dividend increase of 16 percent was relatively low, so does that mean you think your share price is very attractive? Can you speak more about your net-cash-zero goal? 2:43 pm: Luca Maestri: When we come down to capital allocation decisions, the opportunity for us to do some M&A on an ongoing basis, but when it comes down to dividends and buybacks, our view is that, for a variety of reasons, we see a lot of value in our stock. We believe it is undervalued. So we believe a lot in buybacks ... primarily. We're not giving an end date to our capital return program this time since the amount is very large. We'll try to execute it at a very fast pace, but also efficiently... look at our track record over the past five years. i.e. We want to buy back our stock at the right time. We'll give you an update as to our activities at the end of every quarter. 12 months from now, we'll have an update to the entire program. So, you'll be able to keep track of our progress every 90 days. 2:43 pm: Milunovich asks a follow-up question about Apple's interests in healthcare. 2:44 pm: Tim Cook mentions ResearchKit, CareKit, and Health Records on iOS 11.3. Those all came out of getting significantly engaged in the Apple Watch and sort of pulling the strings, so to speak. We also have a Heart Study that is going on. So, I don't want to give too much away, but it's an area of great interest that we feel we can make a big difference in. It's a major strategical area of ours. 2:46 pm: Tim Cook on India: We set a new first-half revenue record. We continue to put great energy there. Our objective over time is to go in there with all of our different initiatives, from retail to everything else. It's a huge market. Many people will be moving into the middle class over time, as we've seen in other countries. 2:47 pm: Tim Cook on China: I continue to believe China is a phenomenal country with a lot of market opportunities. We have almost 2 million app developers in China, writing apps for iOS and the App Store. They're doing unbelievably creative and innovative work. We look at China holistically as not only a market... on the market side, iPhone X as I mentioned before was the top-selling smartphone in the country last quarter... I think on a 90-day clock, lots of different things can happen, but my own personal view of China is that it's a great market. We're certainly looking far beyond 90 days and feel very bullish about the opportunity and environment there. The market for us is more than iPhone. Mac gained share there as well. Watch is getting some traction there. Services is doing extremely well. Several catalysts. I'm very pleased with the results that we were able to show during the quarter. 2:49 pm: Tim Cook on iPhone pricing strategy: We price for the value we're delivering. iPhone X is most innovative product on the market. Jam packed with technologies on the market. Really sets up the smartphone for the next decade. So that's how we priced it. We were surprised somewhat that through all of this period of time, that the iPhone X lines up at the most-popular for every week since the time of its launch, so I think that's a powerful point. And it's #1 in China. Another powerful point. Obviously at some point if those technologies move to lower price points, there is probably more unit demand. But the way we think of it is trying to have a reasonable price for what we've delivering. 2:52 pm: Luca Maestri expects NAND and DRAM component prices to stabilize in the foreseeable future. 2:53 pm: Jim Suva of Citi asks if Apple believes iPhone market share can significantly rise in India, and if investors should start looking for gross margin upside if component pricing stabilizes. 2:56 pm: Tim Cook: In terms of the market in general, if you look at last year, there were still half a billion feature phones sold in the world. Many of those sold into emerging markets. Not all of them, but many of them. We still believe that over time, every phone sold will be a smartphone. It seems to us that with many feature phones being sold, that's a pretty big opportunity. In terms of the iPhone itself, even though we sell quite a few phones across the course of a year, our market share globally is low — sales are low compared to the whole market. Our goal is to convince people with another type of phone to switch, while taking care of people with an iPhone so that when they elect to buy another phone that they buy another iPhone. So we spend quite a bit of time on that ... India is third-largest smartphone market in the world. Obviously huge opportunities there. Extremely low share in that market overall. We're putting a lot of energy there. Working with the carriers in that market and they're investing enormously on LTE networks. Infrastructure has come quite a ways since we began to put a lot of energy in there — thanks to their leadership and so forth. I don't buy the view that the market is saturated. I sort of think the smartphone market is the best product category in the history of the consumer world. 2:59 pm: Apple's conference call has concluded. Apple says a recap of the call will be available by approximately 5:30 p.m. Pacific Time at investor.apple.com. Stay tuned to MacRumors.com for further coverage. I thought no one wanted to buy Apple products? The iPhone X is a failure and too expensive for anyone to buy it. The HomePod is too expensive. The laptops and desktops all need to be updated before anyone will buy them and more. Glad I bought more shares yesterday. w00t! I'm glad I bought shares in the '90s. Apple has become a Phone and Services company. Macs and even iPads are just side projects. Makes me sad, but this is what it is. "Customers chose iPhone X more than any other iPhone each week in the March quarter, just as they did following its launch in the December quarter." Never forget that EPS will continue to be artificially inflated by the share repurchase program. Nothing artificial about real value. They made $13.8B in profit, the most ever in Q2 for AAPL. Not good enough for you? In other words, Apple sold 4.1 million outdated computers last quarter. Remember when the X was announced at $999 and all the defenders said that the margins are worst. Sell less and make more money. Btw I’m an owner of the X but let’s be honest, bean counter CEO raised the price to make more profits, not because the margins were less. And dongles. Do not forget the dongles.